Chilliwack Dentist directory. Find a Dentist in Chilliwack, British Columbia. Health-local is your best resource to find dentist and dental clinics in Chilliwack. 1 links pointing to Chilliwack-dentist.ca were found. The most used keywords in text links are Chilliwack Dentists and Chilliwack. The most important links to the website are from Langley-dentist.ca and Abbotsford-dentist.ca. 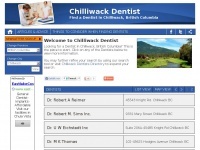 The homepage of Chilliwack-dentist.ca and the subsite are most referenced by other websites. The table shows the most important links to Chilliwack-dentist.ca. The table is sorted in descending order by importance. The table shows websites of Chilliwack-dentist.ca, which are often linked by other websites and therefore they are classified as important content. A profile of Chilliwack-dentist.ca was found on the social network Twitter. The web server used by Chilliwack-dentist.ca is located in Lansing, USA and is run by SourceDNS. There are many websites run by this web server. The operator uses this server for many hosting clients. In total there are at least 451 websites on this server. The language of these websites is mostly english. The websites of Chilliwack-dentist.ca are served by a Apache web server using the operating system Unix/Linux (Unix). The software used to serve the webpages was created by using the programming language PHP. XHTML 1.0 Strict is used as markup language on the webpages. To analyze the visitors, the websites uses the analysis software Google Analytics. The website does not specify details about the inclusion of its content in search engines. For this reason the content will be included by search engines. The website contains advertisements by Google Adsense.